An archangel is a superior or higher-ranking angel found in a number of religious traditions, including Christianity, Islam, Judaism and Zoroastrianism. The word “archangel” derives from the Greek arche (ruler) and angelos (messenger). Archangels serve a variety of functions in the heavenly hierarchy including the administration of heavenly duties and the daily operation of the cosmos. Archangels are also often depicted as engaged in ongoing spiritual battles with demons, or as God's messengers who interact with humanity. According to Christian and Jewish traditions, the number of archangels is seven although sources disagree on the names or identities of these seven celestial companions of God. The four accepted Christian archangels are Michael, Gabriel, Raphael, and Uriel, but disagreement lingers over the status of Raguel, Remiel, Chamuel, Jophiel, Zadkiel, Simiel, Orifiel, Zachariel Selaphiel, Jegudiel, and Barachiel. Each of these latter names has been suggested as the remaining archangels in the different branches of Christianity or Judaism. An Orthodox icon depicting the seven archangels. From left to right: Jegudiel, Gabriel, Selaphiel, Michael, Uriel, Raphiel, Barachiel. Beneath the mandorla of Christ are representations of Cherubim and Seraphim. In art, archangels are usually depicted having larger wings and many eyes. According to scholars, the concept of angels and archangels arose first in the Zoroastrian religion. Zoroastrianism teaches that there are seven heavenly powers or forces, known as Amesa Spentas, who work with God, or emanate from him, to operate the universe. Many scholars suggest that this idea of heavenly powers was probably absorbed into Judaism during the Babylonian Exile, and subsequently influenced the acceptance of angles in Christianity and Islam. The earliest reference to a specific system of seven archangels appears to be in the Pseudepigraphal Enoch I (the Ethiopian Enoch), where the archangels are listed as Michael, Gabriel, Raphael, Uriel, Raguel, Zerachiel and Remiel. Centuries later, Pseudo-Dionysius gives them as Michael, Gabriel, Raphael, Uriel, Chamuel, Jophiel, and Zadkiel. Pope Gregory I lists them as Michael, Gabriel, Raphael, Uriel, Simiel, Orifiel, and Zachariel. Eastern Orthodoxy venerates Michael, Gabriel, Raphael, Uriel, Selaphiel, Jegudiel, and Barachiel. (Spenta) Armaiti, translated as "(Holy) Piety," "Devotion," or "Serenity,"
Vohu Manah, translated as "Good Thought" or "Good Purpose,"
Aša (Vahišta), translated as "Justice and Truth" or "(Best) Truth." Each of the Amesa Spentas helped to create a particular part of creation and now presides over it. Though Spenta Mainyu is counted among the Amesa Spentas, he is often identified with Ahura Mazda (Ohrmazd, Modern Persian Hormaezd), the creator of the remaining six Amesa Spentas and considered above them. There are no explicit references to archangels in the canonical texts of the Hebrew Bible. Indeed, even references to angels are uncommon except in later works such as Daniel. The earliest reference to archangels is found in the literature of the intertestamental period (e.g. 4 Esdras 4.36). It is therefore widely speculated that Jewish interest in angels was learned during the Babylonian captivity. According to Rabbi Simeon ben Lakish of Tiberias (230-270 C.E. ), all the specific names for the angels were brought back by the Jews from Babylon, and some modern commentators argue that the details of the angelic hierarchy were largely Zoroastrian in origin. Within rabbinic tradition and the Kabbalah, the usual number given is at least seven: Michael, Raphael, Gabriel, Uriel, Sariel, Raguel, and Remiel (possibly the Ramiel of the Apocalypse of Baruch). Zadkiel, Jophiel, Haniel and Chamuel are also sometimes listed as archangels. In Islam, the archangels are Michael, Jibril, or Gabriel), Azrael and another unnamed angel, presumably Iblis, before he fell. Azazel was a leader of all angels though not an angel himself, but fell from his position during the Creation for refusing God's commandment to accept Adam and the human race as superior beings. Iblis was a Jinn, not an angel. In Islam, Michael is archangel of the weather, Jibril is the archangel who brought the Qur'an to Muhammad, Azrael is the angel of death, Isra'afeel, or “Israfil” is the archangel who is to blow the horn on Judgment Day, Malik is the keeper of hell, and Munkar and Nakir are the angels of interrogation, who will question deceased souls about their lives. However, neither Israfel nor Azrael are mentioned in the Qur’an, but they find mention in later Islamic works. It is emphasized in Islamic texts that angels are genderless. The New Testament rarely speaks of angels, and makes only two references to archangels, Michael (Epistle of Jude 1.9) and a reference to a "voice of an archangel" that will be heard at the return of Christ (1 Thessalonians 4:16). 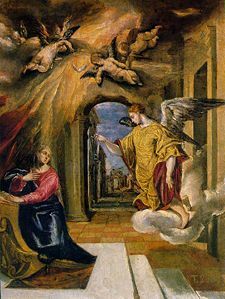 Contrary to popular belief Gabriel is not mentioned directly as an archangel in the Gospels. In later Christian tradition, however, there are three archangels: Michael, Gabriel, and Raphael (sometimes Uriel is given as a fourth). Eastern Orthodox tradition mentions seven archangels. Uriel is included, and the other three are most often cited as Selaphiel, Jegudiel, and Barachiel. Sometimes Satan is considered a fallen archangel whose original name was Lucifer. Some Protestants view Michael as the sole archangel, and the only one explicitly mentioned as such in the Bible. Jehovah's Witnesses believe that Jesus was actually the archangel Michael incarnate. In their view, Michael is the first and greatest of all God's creatures. The Protestant Bible actually never mentions a “Raphael,” and thus this particular archangel is not recognized by many Protestants. Raphael, however, is mentioned in the Book of Tobit, one of the deuterocanonical books. In the story, Raphael comes to the aid of Tobit, healing him of blindness, and driving away a demon that would have likely killed his son Tobias. The seraphim, singular seraph, are the highest order of angels, serving as the caretakers of God's throne and continuously singing his praises: “Holy, holy, holy is the Lord of hosts. All the earth is filled with His Glory." It is said that they surround the throne of God, singing the music of the spheres and regulating the movement of the heavens as it emanates from God. It is also said that such a bright light emanates from them that nothing, not even other divine beings, can look upon them. There are four of them surrounding God's throne, where they burn eternally from love and zeal for God. The seraphim are mentioned in Isaiah 6:1–7. Many Christians believe that the devil is a fallen angel who was among the seraphim prior to his fall from heaven. He is believed to have been the angel of light as well as second in power to God. Unlike other seraphim who have six wings, Satan is portrayed as having had twelve wings. The cherubim, singular cherub, are beyond the throne of God; they are the guardians of light and of the stars. It is believed that, although they are removed from humanity's plane of reality, the divine light that they filter down from heaven still touches human lives. Cherubim have four wings. They also have four faces: one of man, ox, lion, and eagle. Through the four faces, they are able to anticipate what God could do to bring salvation to humanity through his son: (a) The face of the man suggests wisdom, compassion, intelligence, and humanity as the Son of God. (b) The face of the lion speaks of kingly appearance and pictures Christ as King, which is Matthew’s emphasis. (c) The face of the ox portrays a servant, the emphasis seen in Mark. (d) The face of the eagle speaks of heavenly action. Cherubim are considered the protectors. They guard Eden and the throne of God. Their rank among angels is uncertain but they are always categorized in the first sphere. Cherubim are said to have perfect knowledge of God, surpassed only by the love of the Seraphim. The Cherubim are mentioned in Genesis 3:24, Ezekiel 10:17–20, and 1 Kings 6:23–28. The thrones, or ophanim are angelic beings shaped like shiny orbs of shifting colors. Their duty is to carry the throne of God around in paradise, hence their name. They are said to be the companion angels of the planets. According to the book of Ezekiel, the thrones are described as a wheel intersected by another wheel, one to move forward and back, the other to move side to side. These wheels are then dotted with innumerable eyes. The prophet does not explicitly describe these wheels as angels in his vision of heaven, but as objects in which the spirits of "living creatures" were contained. Angels of the second sphere work as heavenly governors. The principalities are angelic beings shaped like rays of light. They lie beyond the group of archangels. They are the guardian angels of nations and countries, and are concerned with the issues and events surrounding these, including politics, military matters, commerce, and trade. One of their duties is to choose who among humanity will rule. Paul used the term principalities in Colossians 1:16 and Ephesians 1:21 & 3:10, but he may have used it to refer to the principalities of the world, a nation, a country, or a society, instead of referring to angels. The virtues, also called fortresses or strongholds, lie beyond the thrones and are equal to the principalities. Their task is to oversee groups of people. They are shaped like sparks of light that inspire humanity to many things such as art or science. It is unclear how the name of this order originated. The powers are angelic beings shaped like brightly colored, hazy fumes. They are the bearers of conscience and the keepers of history. The angels of birth and death are powers. They are academically driven and are concerned with ideology, philosophy, theology, religion, and documents pertaining to those studies. Powers are the brain trusts; they are a group of experts who serve as advisers and policy planners. Their duty is to oversee the distribution of power among mankind, hence their name. Paul used the term powers in Colossians 1:16 and Ephesians 1:21, but he may have used it to refer to the powers of nations, societies, or individuals, instead of referring to angels. The dominions, also known as the hashmallim, hold the task of regulating the duties of lower angels. They receive their orders from the seraphim, the cherubim, or God himself, and are responsible for ensuring that the cosmos remains in order. It is only with extreme rarity that the dominions make themselves physically known to mortals. Instead, they quietly concern themselves with the details of existence. Paul uses the term dominions in Colossians 1:16 and Ephesians 1:21, but he may have used it to refer to the dominions of nations and men, instead of referring to angels. The Seven Seals of the Seven Archangels from a 16th century treatise, The Complete Book of Magic Science; the seals of the Seven Olympian spirits are also shown. The archangels are usually considered the second lowest order of the third sphere; these angels tend the larger arenas of human endeavor and act as the administrative leaders of the heavenly beings. An archangel is usually given a task that is of great importance to men. The word archangel is used only twice in the canonical Scripture, but several times in the Septuagint. Once it is used to refer to Michael the archangel (Jude 1) and another time it is used to refer to a being, believed to be Gabriel, during the return of the lord (1 Thessalonians 4). Gabriel is preferred over Michael because Gabriel is the messenger angel. The seven archangels each figure in some systems of ritual magic, each bearing a specific seal. Some insist that archangels are not a separate order but that the traditional Catholic archangels (Michael, Raphael, Gabriel, and sometimes Uriel) are either cherubim or seraphim in addition to being archangels. Sometimes, Lucifer is considered to have been an archangel before his fall. As God's "second in command," it is not likely that he was below the seraphim, therefore, it is possible that he had been both. The angels are the lowest order of the angels, and the most familiar to people. They are the ones most concerned with human affairs. Within the category of angels, there are many different kinds with many different functions. In general, each angel is sent as a specific kind of messenger to human beings. In Jewish Kabbalistic mysticism, the main archangels (Michael, Gabriel, Raphael and Uriel) are invoked as guarding the four quarters, or directions, and their corresponding colors are associated with magical properties. Various occult systems associate each archangel with one of the traditional seven luminaries — the Sun, the Moon, Mercury, Venus, Mars, Jupiter, and Saturn — but there is disagreement as to which archangel corresponds to which body. Encyclopedia Britannica Online. amesha spenta Retrieved May 23, 2007. Boyce, Mary. Textual Sources for the Study of Zoroastrianism. Manchester University. 1984. Copeland, Mark. Ministering Spirits: Angels In The Old Testament Retrieved May 23, 2007. Copeland, Mark. Terms And Descriptions Of Angels Retrieved May 23, 2007. Spiritual.com.au. Angels and the Angelic Realm Retrieved May 23, 2007. Tatum, Johnny. Hierarchical Chart of Angels Retrieved May 23, 2007. Tatum, Johnny. Distinguishing the Higher Ranked Retrieved May 23, 2007. The Bible. an online Bible Retrieved May 23, 2007. This page was last modified on 5 November 2008, at 12:47.